In 2014 a little game called Nidhogg arrived on PC and PS4… it promptly blew the minds of anyone that gave it a chance. A game with a seemingly simple goal of reaching the end of the screen soon became one of the most strategic, fun filled yet soul destroying moments in gaming. The moment you came across that first opponent it dawned on you that this was a game crafted with such strategic depth. Each encounter could be over in milliseconds, or become a twenty minute battle of attrition where you and the opponent opposite would both struggle to find a chink in the other’s strategy. Four years on then and Messhof have finally decided to grace us with a follow up. But is this one that will delight the wurm, or fill it with disgust? 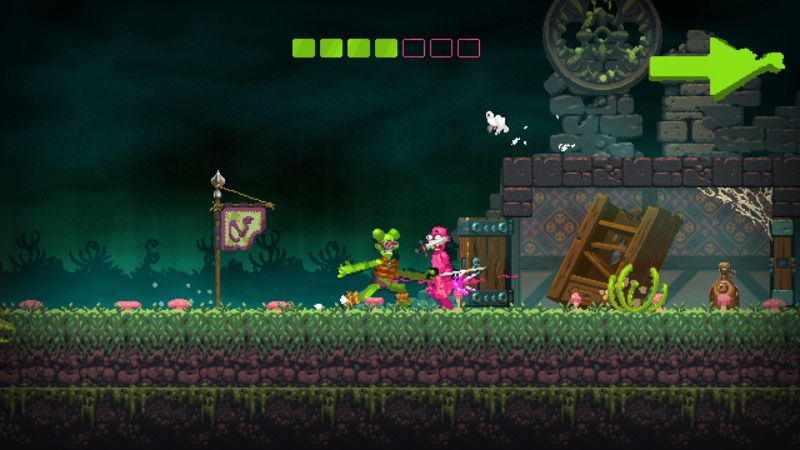 The goal of Nidhogg 2 remains the same as the original; you need to make your way to the end of each multiscreen level to be devoured by the frankly disgusting looking wurm, whilst your opponent is trying to do the same in the opposite direction. What ensues is a frantic, unpredictable tug-of-war style duel to see who has good enough wits, skill and reflexes to reach the final screen and meet the titular wurm. This is the core of the game and runs through all the available modes. There is the single player mode that has you running through a variety of levels against an increasingly difficult AI opponent, and there is a local multiplayer option, delivering one-on-one matches or tournaments for up to eight players. There is also an online mode that allows for battles against friends or strangers. 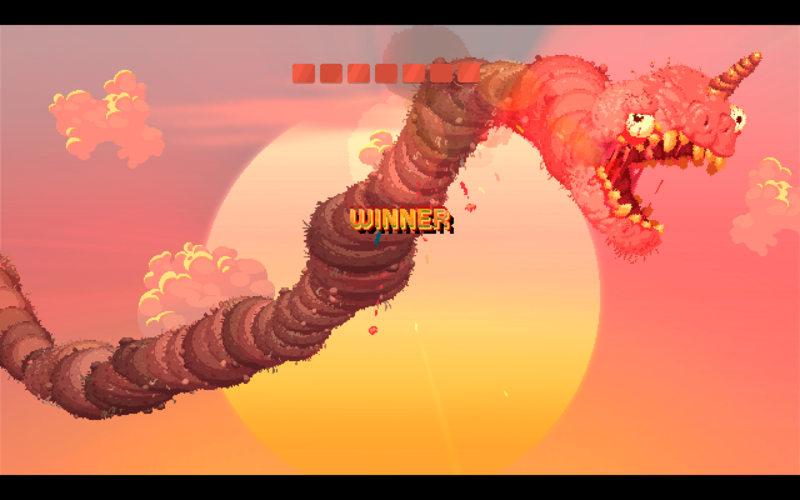 The single player side of Nidhogg 2 is okay, but it is a pretty quick run through and only really serves to sharpen your skills for games against human players. See, it doesn’t quite manage to give you that same sense of jubilation you feel when facing a human opponent and, more often than not, you will find that it is pretty easy to sprint through each of the levels, decimating the AI as you go. Facing off against human opponents is a whole different scenario. Each match begins with you and your opponent facing down on the middle of the screen to see who takes the early advantage. Controls are simple yet deep; you have an attack button, a jump button and the analog stick moves you left and right or adjusts your stance up and down. It is these combinations of stance changes, jumps and attacks that will begin to open you up to the depth involved, as every single move in the game can be countered. 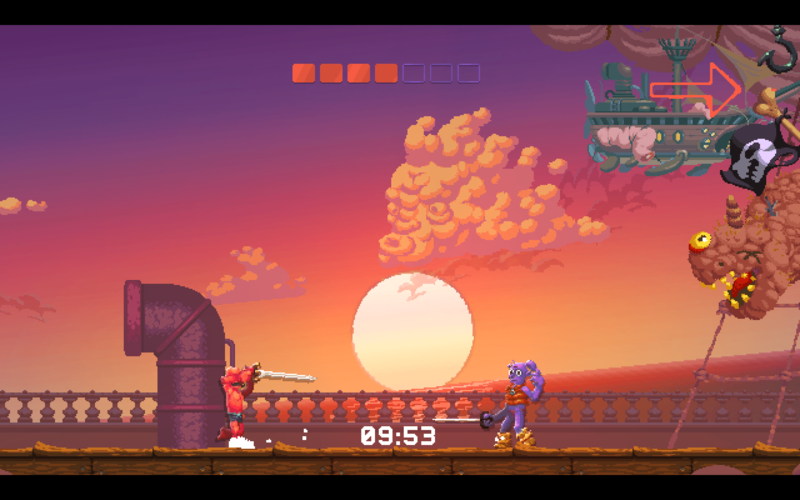 A lower stance for instance opens you up to high and middle stance attacks, yet you can counter that by flicking up at the right moment to disarm your opponent as they lunge their sword towards your bright orange face. This in turn opens them up to a follow up attack. These simple controls begin to offer up more and more as you find yourself dive kicking, rolling, sliding and lunging face first at each other. It is this constant battle for the upper hand that can turn the tide of a match from a quick sprint, to a twenty minute battle for just one screen, safe in the knowledge that every single moment of those will be absolutely tense. It is made all the more so by knowing that even grazing the opponent’s weapon means death. If you win that screen however the jubilation is unlike anything you will have felt in a game previously, but if you lose you find yourself wanting to absolutely destroy the person holding that other controller. This time around the game also adds more weapons to the arsenal. Alongside the standard sword you can now expect to find daggers, broadswords and even a bow and arrow. This opens the door for even more strategy – facing a bow wielding opponent for instance forces you to change up the way you play, having to push towards them all while dodging or blocking the arrows. It is amazingly satisfying to deftly parry an arrow only to watch it fly into the face of the player that fired it, or to use a dagger to disarm a broadsword wielding opponent and then follow up by gently strolling into them with the dagger raised. It isn’t all rainbow wurms and disgusting butterflies for this sequel though as there are a few issues that need to be addressed. While the new art style is bright in colour and energy, it feels like a step in the wrong direction. The original used a simple pixelated style to bring to life a game that often felt a lot like the original Prince of Persia. This on the other hand feels more like Nidhogg does Boogerman; the stages of the original look like someone has swallowed various colours of paint only to vomit them back on the screen, it just isn’t pretty in any sense. There also isn’t an awful lot of new content here for those that played the original; no new modes and just a couple of extra stages along with the aforementioned fresh coat of paint and new weaponry. That may leave players of the first game feeling a little short changed. You won’t find a huge amount of gameplay variety on offer here either, which does mean that the game can become a little tedious at times. Often you may find yourself becoming a little bored… but the overall draw ensures that you will soon come back for more. 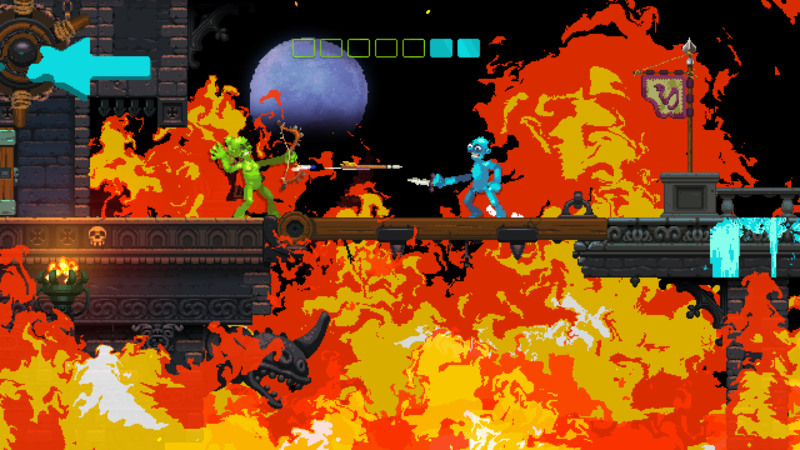 In all though, Nidhogg 2 is an incredible game that offers up wonderfully tense and deeply strategic gameplay whilst trying to keep the tongue firmly in its cheek. While the single player doesn’t always work as it should, the multiplayer is easily worth the asking price just for the way it can make you feel. This is certainly one to pick up if you’ve never played the original.